I have toyed with dry brushing for a while but never committed to it because, as it turns out, I never found the right brush. Some were too stiff and scratched my skin, others too soft, which made them ineffectual. When I was offered this beautiful body brush, I decided to try once more. I agreed to provide an honest review, and I'm delighted to say that I find this brush just about perfect. The look is high-end spa with lovely detailing: the body and handle are made of beechwood, finished with a low-sheen varnish, and beautifully contoured. The bristles are natural boar, not excessively long, and firmly attached through a plastic shield (a feature I have not seen before), designed to protect the wood from water. 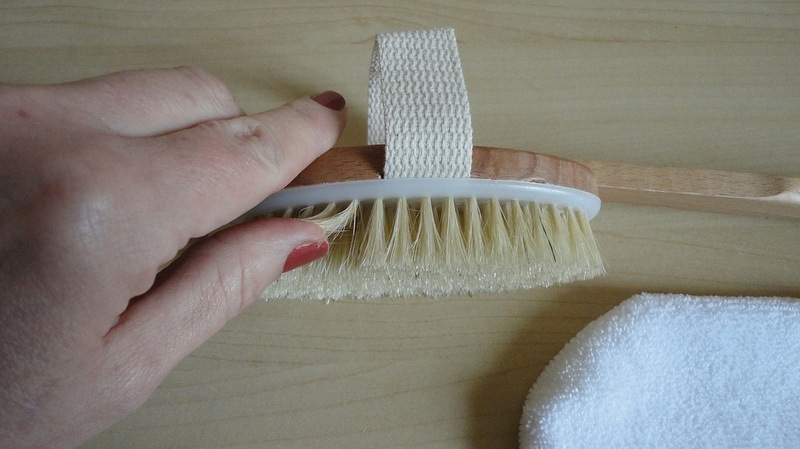 The brush head has a natural-fibre woven strap to provide a secure grip when used by itself. The handle is easily removable, long enough to reach half way down my back, and solid without being too heavy. A cotton cord loop allows hanging. 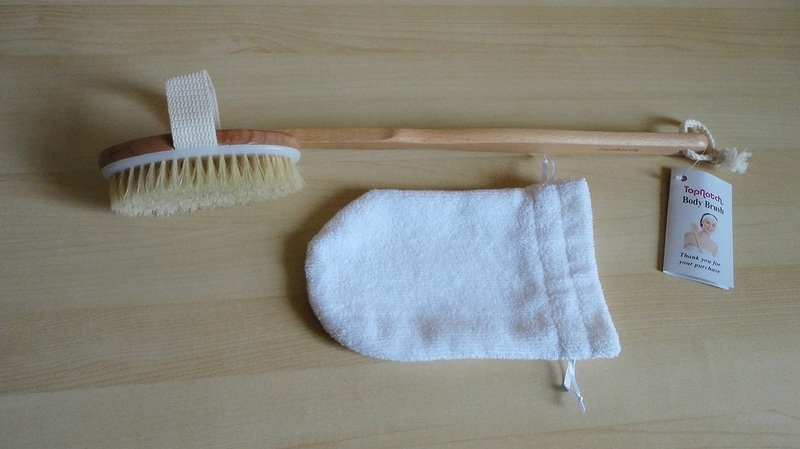 A super-soft terry cloth storage bag is also included, which can be used as a wash glove. Also available, as a free gift with your purchase, is a PDF version of a short book explaining clearly and concisely the benefits of dry brushing, and illustrating correct technique with drawings. The book was an unexpected bonus, and I would recommend reading all of it, as I have found some quite confusing and inaccurate information on-line, which did not help my previous efforts. In use, this brush is wonderful. Just the perfect combination of firm and supple, allowing me to vary my strokes according to where I am using it. The movements should approximate the final strokes of a massage, long and sweeping, generally in the direction of the heart. The illustrations show this clearly. Although it is mentioned, I don't like to get this brush wet (except when washing it). I prefer to reserve it for dry-brushing and use the synthetic one (also by TopNotch) in the shower. Since I usually scrub fairly vigorously with a loofah in the shower, I was amazed to see the amount of dead skin that flew off when I dry-brushed the first few times. 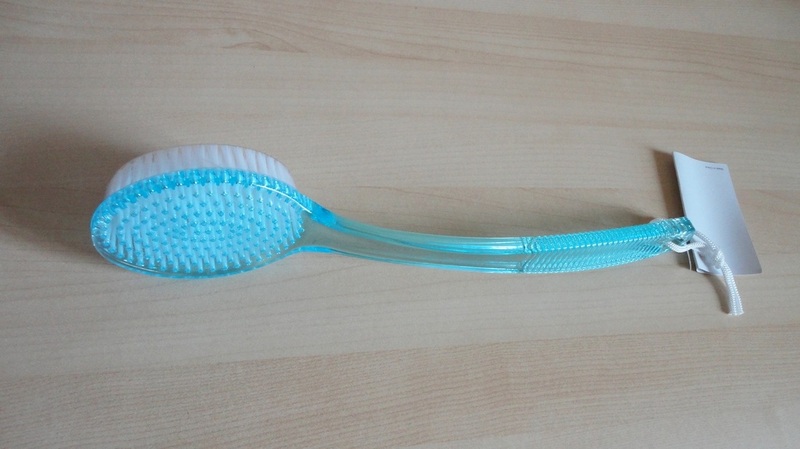 The bristles are very comfortable and, therefore, very effective. A daily all-body dry-brushing session does wonders for my mood and my sense of well-being, as well as making my winter-weary skin smoother, but the main reason I started at all was to address cellulite. For this, it is superb, and my suggested routine is to do a thorough dry-brushing of legs, buttocks and stomach, followed by application of your choice of anti-cellulite gel, lotion or oil, and a more in-depth massage by hand or with a specialized tool. TopNotch have possibly the best massager I have ever used (for which I also wrote a review). I used this brush long enough to be quite enthusiastic about it, and the only thing I cannot comment on is durability. Given its overall quality, I would expect this brush to last well and prove a very good investment, but will update this review should anything change. I've lost count of all the cellulite massage gloves and gadgets I have used over the years. Some were okay but most turned out to be from disappointing to unusable, mostly because they would start to drag on my skin as soon as the lotion or gel I applied was absorbed. This little gem remains comfortable no matter what, I can even use it on completely dry skin. I love the small size and the grip is brilliant, really solid but adjustable. It becomes an extension of my hand and allows me to concentrate on the massage instead of constantly having to shift my grip. 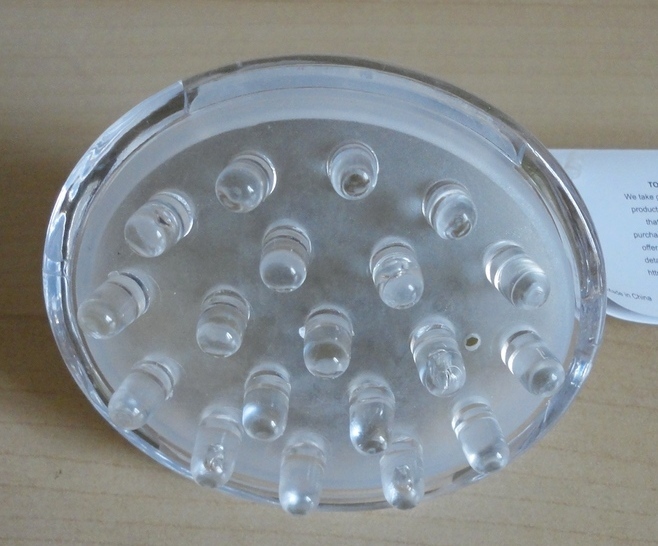 The other unique feature is that the nineteen knobs are flexible and move independently, they sink slightly and each one can rotate in a very shallow arc, all of which gives the massager a very kind action. The little fingers are so smooth and rounded that it is possible to apply very firm pressure on specific area, and really stimulate blood circulation, without hurting the skin. The open design also makes it easy to wash, although it already tends to stay a lot cleaner than most. Given my experience with so many different massaging devices, I know this one will give results because it is so pleasant to use and lets me continue to massage long after the product has sank into my skin. I am very happy to recommend this really effective massage helper and the fact that it's so pretty certainly doesn't hurt. 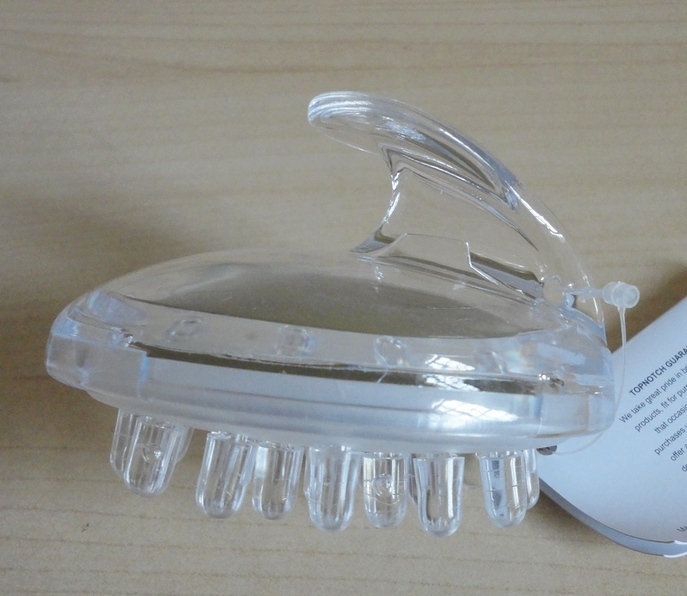 Offered to me for evaluation and review, I find this shower brush one of the best of its kind. I chose the blue one (aquamarine actually) because of my bathroom colours, but it is also available in a pretty pink version. I don't have the best circulation and have been advised to do all I can to improve it. Using a well-made brush like this one is a very easy way to turn a shower into a tonic massage, especially if you have the fortitude to do the alternating hot-cold water thing. The synthetic bristles are kind to the skin but sufficiently firm to be effective. Much better than a bath strap, and much more durable than natural loofah; my last one disintegrated after a few encounters with a cellulite scrub. 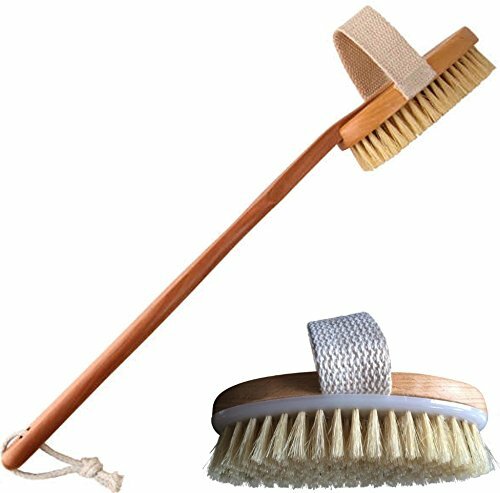 This brush washes well and remains fresh looking, and has a little cord loop for hanging to dry. I love the textured ridges on the handle that give grip when your hands are soapy, and the gently curved handle seems to work well down the back, particularly, and to reach your feet if you have difficulty bending. If you don't want to commit to the expense of a separate brush, this one will also work for dry-brushing before a bath or shower. So a versatile, quality product that seems very easy to keep in good shape, and adds that touch of luxury to your bathroom routine. It's only after you have used a poorly-made brush that you appreciate something like this.